For those who aren't sports enthusiasts, a field goal kicker is a specialized player of American-style football. They are the guy who doesn't play for most of the game and only trots out onto the field when their team has failed to score a touchdown. They are sort of like the last resort for their team to score some points before turning the ball over to the other team. Their job is to kick the ball through the uprights or goal posts. If the ball goes too far left or right--no points. If the ball goes through, they settle for three points instead of the seven you get for a touchdown. So far it's not very much like a writer. The field goal kicker comes in and makes three points--or doesn't. How is that like what writers do? The field goal kicker is part of the team--yet not. He doesn't play the whole game. Sometimes his specialized services are never needed at all for the whole sixty minutes. Usually he only plays for a few minutes at most. The rest of the team, quarterbacks, linemen, running backs, tightends, work together to score. He sits on the bench. Or kicks footballs into a net to warm up his leg. Still not much like a writer, though we do work alone. So usually the field goal kicker doing his thing is sort of a letdown. The team gets three points instead of the more coveted seven. Things could be better. They could be even worse if he misses. BUT sometimes things are different. Every once in a while, the time in the game is running out. The losing team has the ball. That team is less than three points behind. There's no time for a touchdown. There are only seconds remaining. They send in the field goal kicker. And suddenly this player who isn't usually part of the game is the only player who matters. That's when the field goal kicker must show his stuff. And usually he can see it coming. He sits on the sidelines and knows it's going to come down to him. He alone will decide whether the ENTIRE team wins or loses. He alone decides the fate by whether his kick is true. The other team will call a time out to try and ice him. 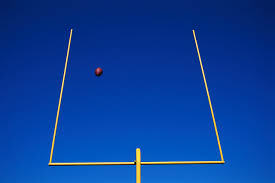 By making the field goal kicker wait for the time out to end, they hope to play upon his nerves and cause him to miss. They want to make very sure he feels every bit of the pressure thrust upon him and only him. And there, my friends, is when a field goal kicker is like a writer. For a writer, too, must be that special sort of someone that cannot be iced. When a review is bad, a writer must stay calm and not react. When a rejection arrives, a writer must bury that and maintain the course. When the edit letter says chop pages or chapters, a writer must face it down and find how to make it work. A writer must have ice in their veins. They cannot be rattled (in public). The writer must stare down that other team (critics) and face those uprights (doubts) and kick that ball through (keep writing). And that is how a writer is like a field goal kicker. Play on, my friends!